ESCONDIDO, Calif. – Whenever an endangered animal dies at the San Diego Zoo, researchers race out, regardless of the hour, to remove its sperm or eggs, maybe a bit of ear or eyeball, and carefully freeze the cells in liquid nitrogen. The icy vials may one day be used in experiments to resurrect recently extinct animals, like the Hawaiian Po’ouli bird. The stainless steel tanks hold the genetic material of more than 10,000 individual animals from more than 1,000 species and subspecies. 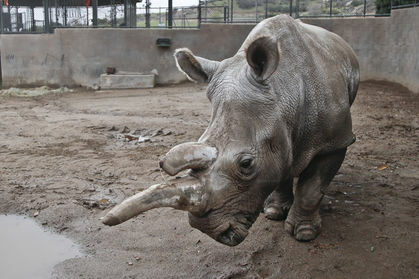 The Frozen Zoo’s work has taken on renewed urgency since the San Diego Safari Park lost 42-year-old Angalifu to cancer in December, leaving only five northern white rhinos left in the world – and all unable to reproduce. Barbara Durant, director of reproductive physiology at the San Diego Zoo Institute for Conservation Research, a.k.a. the Frozen Zoo, stands on the rail of a nitrogen-cooled stainless steel vat holding hundreds of vials of animal cells at the Beckman Center at the San Diego Zoo’s Safari Park in Escondido, Calif.
Scientists are racing to find the best way to utilize the bank’s frozen sperm to produce another one before the northern white goes extinct, which could happen within a decade. Paul Ehrlich, a senior fellow at the Stanford Woods Institute for the Environment at Stanford University, said the world needs to address the problem’s root causes, such as population growth and climate change. With species going extinct at a faster rate, zoos are taking on greater conservation roles and facing decisions on which animals are worth trying to save. Some may be extinct by the time another one is reproduced and possibly never live in the wild. The northern white’s natural habitat is in countries like Sudan and Congo, which have been unable to stop poachers. The horn is coveted in Asia as an aphrodisiac, creating a market that threatens all rhino species. “We can do all kinds of razzle-dazzle things but it’s one thing to make another animal or two or three, but it’s quite another to make a sustainable population from a genetic standpoint,” said George Seidel, a Colorado State University professor who has written about resurrecting the woolly mammoth. “We’re not so much interested in bringing back dinosaurs or mammoths,” she said. The Frozen Zoo holds the cell cultures from 12 northern white rhinos – more than the living population: “There have been other species that have come back from numbers that small so we think there is good reason we can do this with the northern white rhino,” she said. Sperm from the Frozen Zoo has been used to reproduce endangered animals from the giant panda to the Chinese monal pheasant. Its frozen cells also were used to clone two endangered types of cattle. The gaur lived only a few days while the banteng survived for seven years before being put down after breaking a leg. Both animals, however, had genetic defects. Theoretically, stem cells can produce any body tissue. That means thawed stem cells from a male rhino could produce both sperm and egg in the lab, but the method has been done only once – in a mouse.